We provide field trip experiences for local youth summer programs. 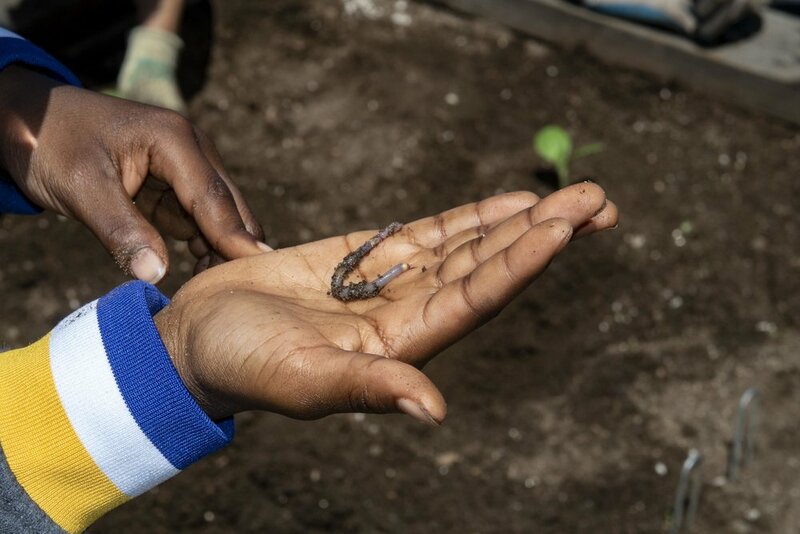 Help young people gain a deeper connection to nature through hands-on garden activities in the middle of the City. We offer private field trips for groups of up to 30 youth on weekdays from 10am - 1pm (depending on availability). Program fees start at $500. Thank you for reaching out about a summer field trip! A GFE staff person will reach out to you shortly with more information. Based on the interests and level of each group, we provide two or three hands-on activities in garden exploration and/or garden care. During our field trips, students help to maintain the compost system for healthy soil (collect plant material, chop, mix, sift), search for worms and other decomposers, plant seeds and seedlings, spread mulch, explore water-wise gardening and much more. In learning how the garden takes care of us, students explore perennial spaces demonstrating how native peoples, and people around the world today, use plants for food, medicine, art, and materials. Garden for the Environment is a dynamic outdoor classroom with demonstration areas covering a wide variety of topics. Nature exists in the middle of the city and our one-half acre garden shares space with thousands of plants, birds, and bugs. In an increasingly academic and technological world, we believe outdoor education is vital and valuable. Gardening for the environment connects creatively with all disciplines – arts, literature, sciences, health and culture. It connects people in a beautiful way. It is universal. Youth have the opportunity to immerse themselves in the garden, connecting with the natural world and each other, creating real, beneficial life skills to take with them after they leave.